Welcome to a scenic alternative to a fixed, closed in, room reception venue. Give your guests a memorable experience that they will cherish forever. Choose from various departure points including Newstead Park, Mowbray Park, Riverside Centre, Southbank and Brett's Wharf. Newstead Park is a favourite whereby the reception can take place in the rotunda, then guests board the vessel for refreshments while the bridal party have their photographs taken. For a unique entrance, the bride may arrive by a Golden Gondola and meet the vessel. DANCE FLOOR Our dance floors have special lighting to provide a night club type atmosphere. A great environment for partying on and enjoying the changing scenery as you dance. BARS Our highly polished custom timber bars are equipped with great staff and plenty of cold drinks. We provide popular beers, a large variety of spirits, shooters and quality wines and we can also order in special requests. 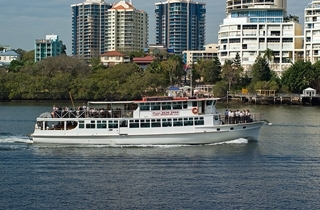 Built in 1972 by Milkraft in Brisbane and features: 3 decks, 2 saloons, 6 separate areas to suit any group, and large dance floor. A substantial ship, she was originally built to operate out to the Great Barrier Reef and provides plenty of back up systems for power, refrigeration, toilets and access. Extensive renovations are continually being undertaken, including refreshing the classic timber craftsmanship, lighting, refurbishment of toilets and saloons.